Deal: 30,000mAh Aukey power bank with Quick Charge 3.0 and PD gets discounted on Amazon, save 26%! If you're looking for a high-capacity portable charger capable of quickly topping off your phone, tablet, or laptop, the latest deal at Amazon might be just for you. A 30,000mAh Aukey power bank is enjoying a sizeable discount at the e-commerce site. 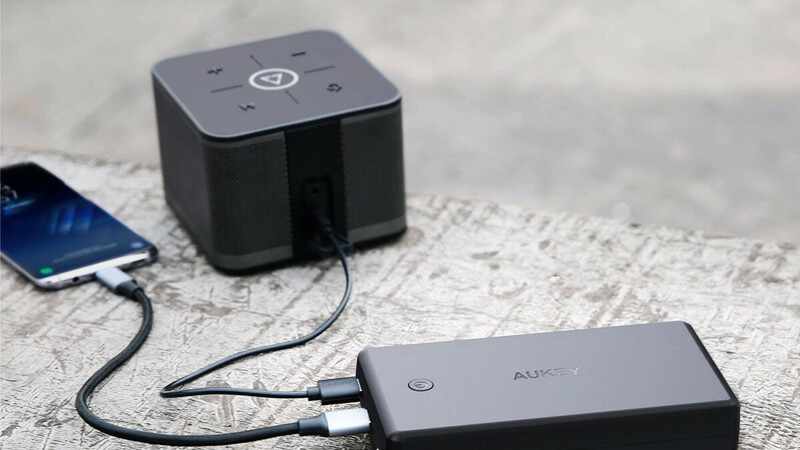 Applying a coupon (located below the price of the product) allows you to save 26% off the MSRP of the Aukey PB-Y7. Aside from offering lots of backup power, this charger also boasts ultra-fast charging thanks to its support of the Qualcomm Quick Charge 3.0 and USB-C Power Delivery standards. This power bank can charge a MacBook as fast as the original wall adapter for the laptop. When charged up, this power bank can get you away with being away from civilization for almost a week - it can fully charge up an iPhone XS up to 9 times, a Galaxy Note 9 up to 8 times and you can get almost 2 full charges on a 12-inch MacBook Pro. Of course, this product is neither delicate nor slim - with a weight of 1.22 lbs, you will definitely notice when the power bank is in your backpack. The power bank comes with a USB-C to C Cable, 45-Day money back guarantee and an extended 24-month warranty. If this deal interests you, feel free to follow the below widget to Amazon. And where is the below widget?